The Valiant Comic Cinematic Universe took its first major step today as Sony Pictures announced a five-movie deal to bring the publisher’s heroes to life. First up: Two movies based on the X-Men-esque series Harbinger, two about the nanotech-infused assassin Bloodshot, and Harbinger Wars, a movie to combine them. 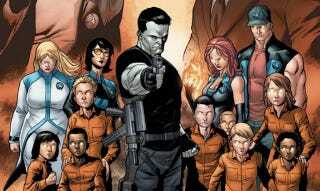 For Harbinger, Heisserer will provide the script solo, while potential directors are being kept under wraps for now. All five movies will be produced by Valiant’s Dinesh Shamdasani, along with Original Film’s Neal H. Moritz and Toby Jaffe (The Fast and Furious franchise, 21 Jump Street). Andrea Giannetti will oversee for Sony. This is all well and good, but really, we need a movie of Valiant’s fantastic, insane, scifi buddy comedy Archer & Armstrong, followed by Valiant’s superhero buddy comedy Quantum & Woody. All of the publisher’s revamped titles have been strong since they returned, but I’m not certain how easily Bloodshot and Harbinger can distinguish themselves against all of the other superheroes movies on the market. But Archer & Armstrong? Neither Marvel nor DC has anything like it. I really, really hope Valiant has chance to get them on movie screens.